John and I were really pleased to be able to host another Musk Muster in January. Always a highlight for us! Ride stats: 14 riders, 1 pillion, 17 for the BBQ, 15 campers and 5 dogs. We started the ride at the airport viewing area (thanks Brett for escorting some of the riders from South Yarra). From there took a ride through Diggers Rest and some delightful back roads over Mt Gisborne into Gisborne and the after a short run up the Calder took some more back roads through to Trentham for morning coffee at the Red Beard Bakery. The Saturday market was in full swing but sadly there was no time to grab any local bargains. We were joined by Adam in Trentham. From there we headed to Heathcote via Kyneton, Lancefield and Pyalong. 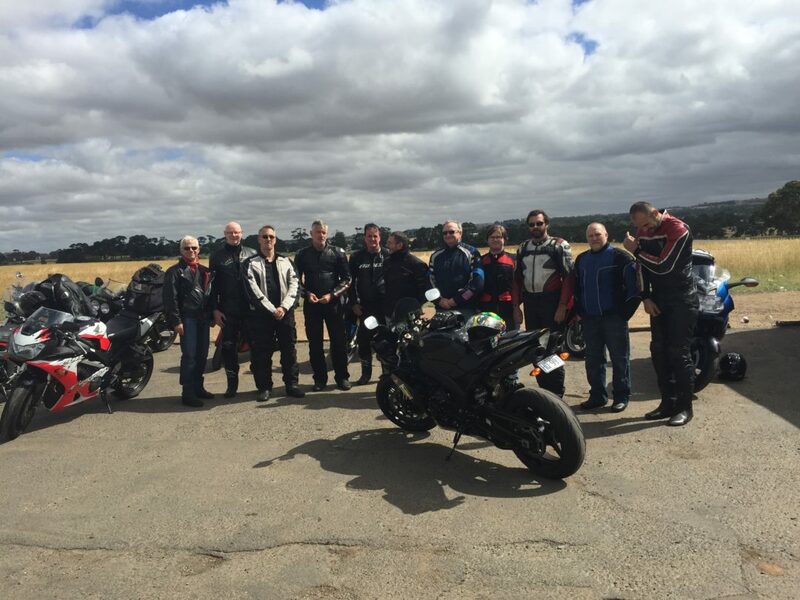 There we met up with Dean and Doug who had ridden down from Euroa to meet us. We had lunch in Heathcote at the bakery, refuelled and before heading to Maldon via Sutton Grange and Harcourt. Adam made his way home from Heathcote. From Maldon we rode to Carisbrook via Barringhup then turning back towards Musk via Newstead. Rolf, Stephen, Peter Ha and Tim made their way home from Maldon. The rest of us arrived back to Musk around 5.00pm having ridden around 360km. Some really delightful roads, some of which I hadn’t ridden before. I love how you always find another back road! The weather was also great with mild temperatures which made for lovely riding conditions. Michael who was escorted by Chloe and Heidi in the Land Rover were already in Musk to welcome us. We were later joined by Steven, Darren and Ian and a little later John with Andy and Lady Jane. Gary and Michael drove through from Chewton to also join us for the BBQ. Tents were pitched, swags rolled out, BBQ lighted we settled in for a relaxing evening. Thanks to those manned the BBQ and cooked the burgers and snags! Wayne rode up from Melbourne to join us for breakfast at the Good Food Store in Daylesford on Sunday morning before everyone made their way back to Melbourne. All in all a great time was had. We did however have some tension in the group when Camp had is canine harem upset by the arrival of Andy whom he proceeded to fang. Champ wasn’t having anyone (especially an 11 year old Pomeranian around the size of his head) come between him and the new love of his life, Chloe. Fortunately no blood was let just a few ruffled fur coats. Chloe was totally unfazed and really had little interest in returning Champs affection anyway! Andy is in therapy for PTSD and Polly is again the sole recipient of Champs canine affections. Like sands through the hour glass, so are the days of our lives….